Did you hear? There are some big changes coming to the Disneyland Resort in preparation of Galaxy’s Edge opening this May at the Disneyland Resort. If you don’t have the need for a stroller, you might be surprised that this is a huge topic for many as the size of strollers are now going to be more strictly enforced. 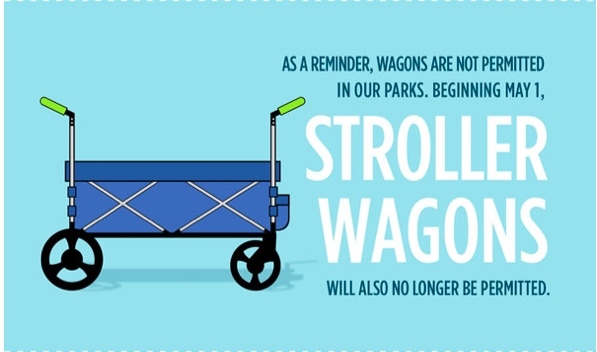 The even bigger outcry is from the all out banning of the so called Wagon aka Kleez which over the past couple years has become the vehicle of choice for many when toting their children and their personal belongings to the park. So whats the big deal? Well Double wides are! With floor space soon be be at an ever bigger prime, these beauties can take up some serious real-estate, impede traffic and use up a lot of stroller parking so many will no longer make the cut. I have a short list of the double wide strollers that will be allowed into the park after May 1, 2019. As for the wagons aka stroller wagons, they are all banned, period. Via Disneyland Resort: Strollers that are greater than 31” in width and 52” in length will be prohibited. Stroller wagons will also be prohibited. I personally have utilized the Red Tag system in the past for my autistic daughter in conjunction to their DAS. Back then I had a jogger we used that had a swivel front wheel making getting around a breeze while providing my girl a place to escape the crowds, the heat and to decompress between rides. Since we normally didn’t spend too many hours at the park it really was an efficient way to quickly get around the park and get out when the place got too over stimulating. I was very grateful for this additional accommodation and we happily no longer need it. “Will there be the ability to still use the keenz wagons if they are "Red Tagged" as a stroller in addition to the DAS system”. Guest Experience Services: “Please know that our approach to supporting Guests with disabilities has not changed, and our commitment to providing a welcoming, inclusive atmosphere as well as accessible experiences for everyone is unwavering. While we cannot make arrangements prior to arrival, we understand each Guest’s needs are different, and our Guest Relations Cast Members will continue to review in-person inquiries on a case-by-case basis. Once you arrive, Guest Relations will be happy to discuss the needs of you and your family and as well as all of the available options that will help you make the most of your time”. My follow up to further clarify got this response: “Thank you for the response. So are you saying guests entering the park via security will not be turned away if they have a wagon with them and utilize it for thier disabled family member(s)”. Guest Experience Services “Please know that Security is aware that Guest Relations at our Theme Parks review each situation on a case-by-case basis. If you have any concerns upon arrival, please ask to speak with a Leader”. My response from the Guest Experience Services email is in no way the definitive answer, I invite you to get information personally as this new rule change applies to you and that each case is different. I can only hope this will not lead to further abuse of the disability accommodations the park offers and that those who truly need this help to equally enjoy their time at the park are not chastised and judged as entitled. As with every change that has occurred and effected the disability community at the parks, I feel they always work it out to the best of their abilities. It will not be a one size fits all. You know your Childs limitations and needs best so I always encourage advocating in the most polite way possible.